National Weather Service issued the flood warning for the Connecticut; Flood watch advisory remains in effect for Northern N.H. 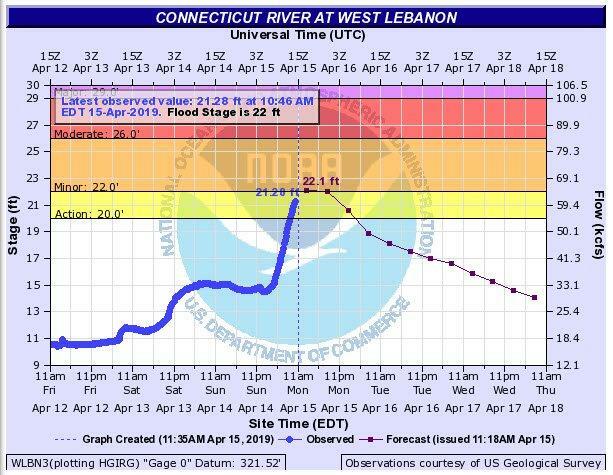 The National Weather Service issued a flood watch for the Connecticut River near West Lebanon this morning. There is also a flood watch for northern New Hampshire. The flood warning for the Connecticut River is in effect until late Monday night. At 10 a.m. the stage was 21.3 feet, when the flood stage is calculated at 22.0. Minor flooding is in the forecast after the water reaches 22.2 feet, sometime Monday afternoon, according to the Weather Service. There is a flood warning for the Pemigewasset River at Woodstock until Monday morning. Minor flooding is anticipated.